7.2 brought the never-ending AP hunt back into the game with a vengeance. 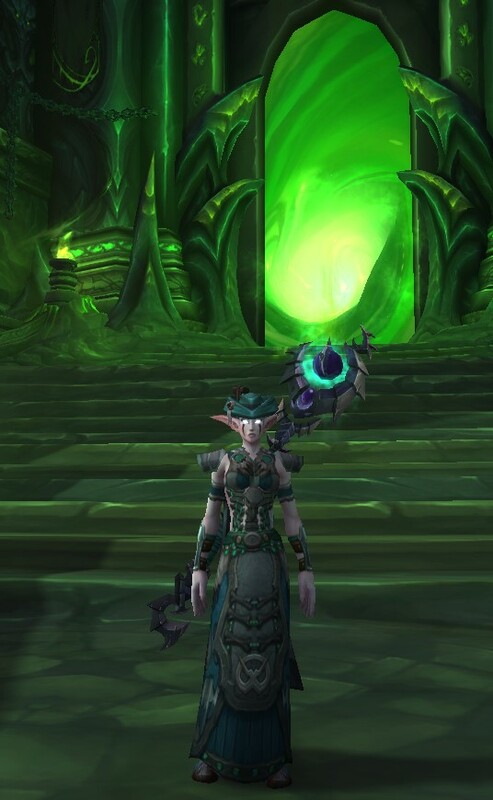 I was really enjoying being level 54 on my resto artifact as I didn’t feel the need to actively hunt AP for a couple of months and it was glorious. But with the rather significant AP black hole that our artifacts are, now 7.2 is live, I’m once again more focused on Z gathering up AP as much as possible. 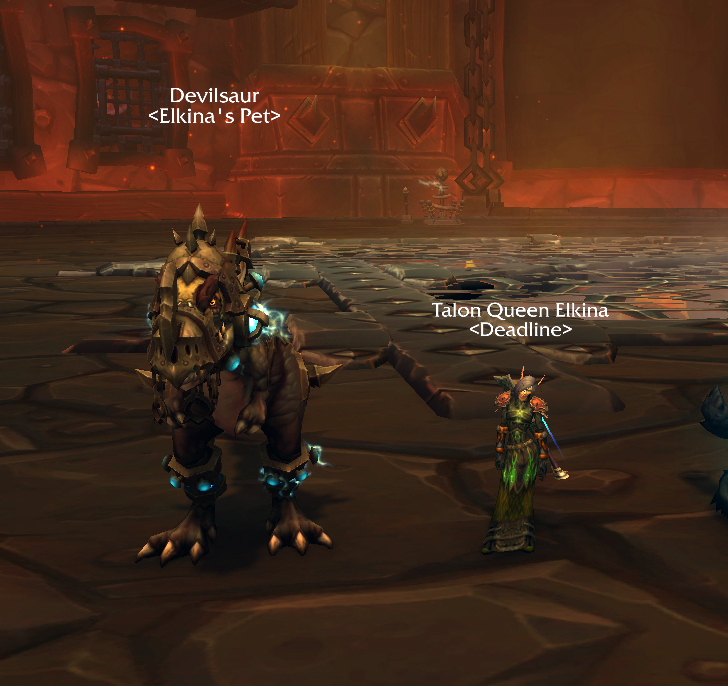 So it’s back to mythic dgn spam, lots of world quests and popping into the different levels of raids available. Luckily being able to increase our AK twice this week (26 & 27) has seen the amount of AP granted skyrocket. Even so it’s going to be a long grind. 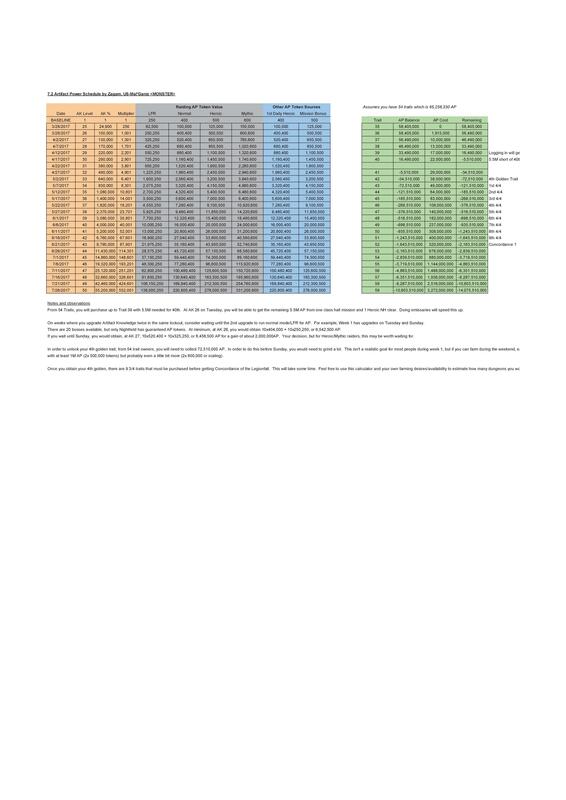 This table was linked into our guild’s discord today. Zagam over on Mal’Ganis has gone to a lot of effort mapping out dates and amounts in a great, if daunting, table. I’ve decided my AP focus will be to reach the 4th golden trait which refreshes the duration of my hots on a target below 35% health and then I’ll start dropping more points into all mana regen traits before assessing what other traits I want to boost a bit. 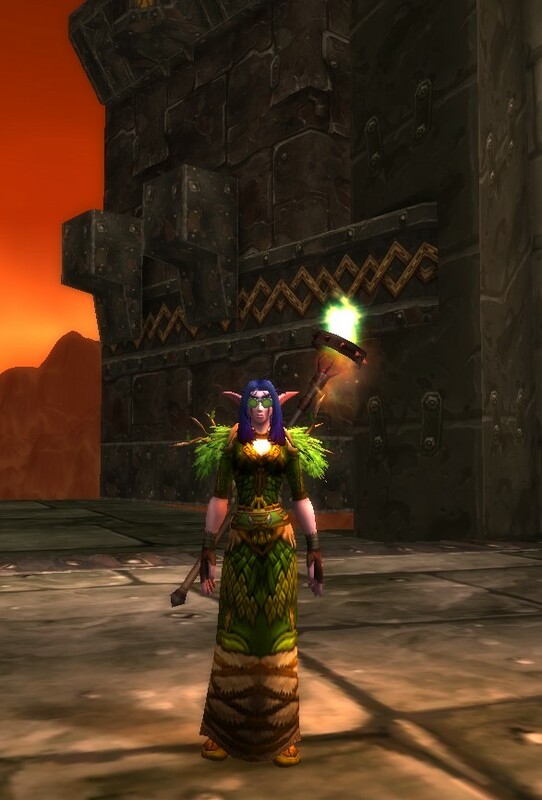 I managed to get to level 41 just before raid last night, so the golden trait is only 38m AP away. 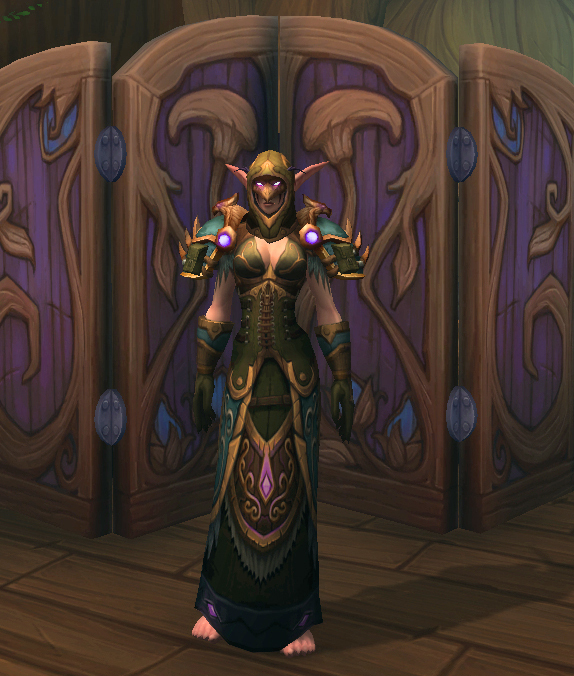 In between all the questing and dungeons, I’ve been buying up PvP transmog sets. Doing the PvP world towers daily has slowly seen my Marks of Honor pile up so I popped down to Warspear to collect a couple of the Warlords sets and then over to Kun-Lai for some MoP sets. Besides all the individual set achievements, I also picked up the overall achievement for collecting 10 sets which gives the Stylist title. 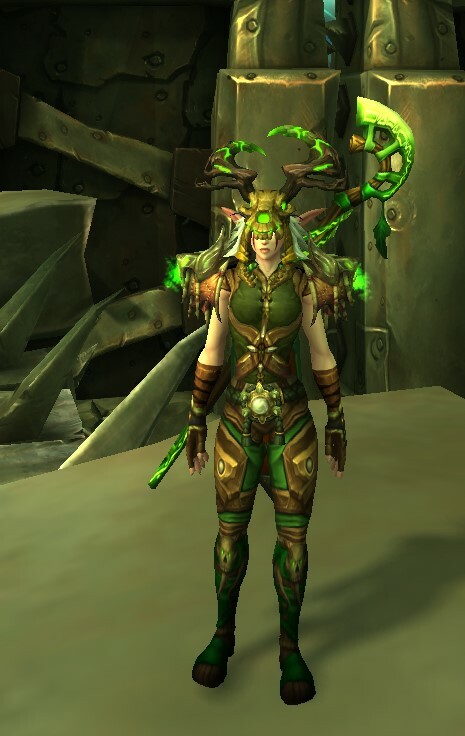 There’s a ton of sets that I’m only missing one or two pieces so I will probably be spending a lot of time in old raids on my Druid. I haven’t even looked at what my other toons have, I’m thinking the hunt for completing sets could keep me very busy for a quite a long while. 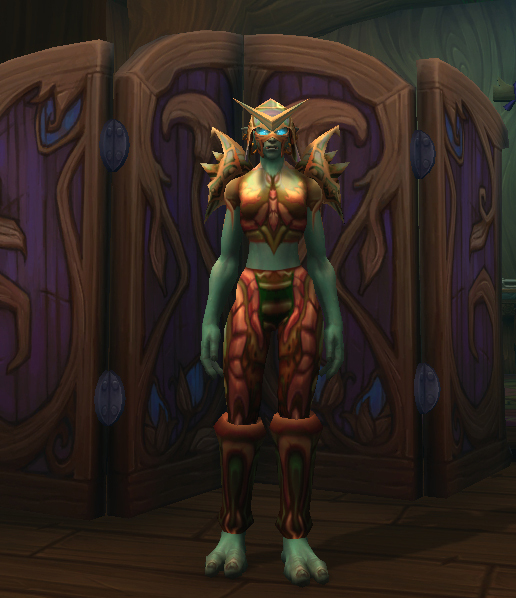 Ever since I realised that the armor racks in the order halls could be completed and display the head and shoulders of Tier 1 though 10, I’ve been working on getting Zee’s sets completed. It did help having 2 100+ druids; if a piece didn’t drop I could go try again but it’s still taken quite a few weeks for the RNG to be in my favour and collect all the pieces for the 10 sets. Out of all the sets, my favourite is the Thunderheart set as a whole, though there are pieces I like from each set. 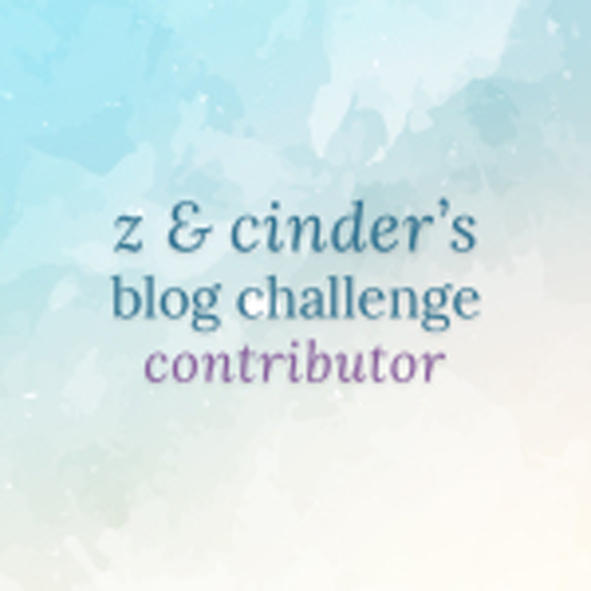 I didn’t actually realise until writing this post that there were two different appearances for Tier 9 depending on which faction you are. 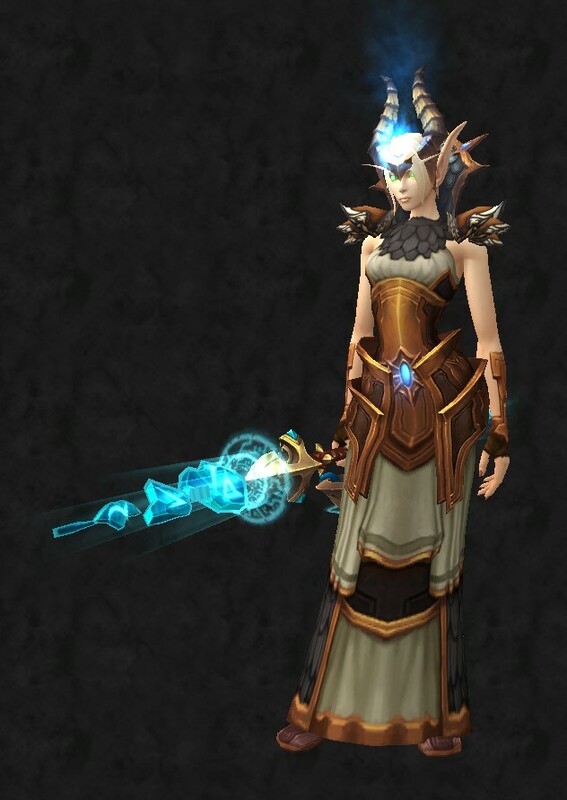 I much prefer the Alliance Malfurion’s set over the Horde version. 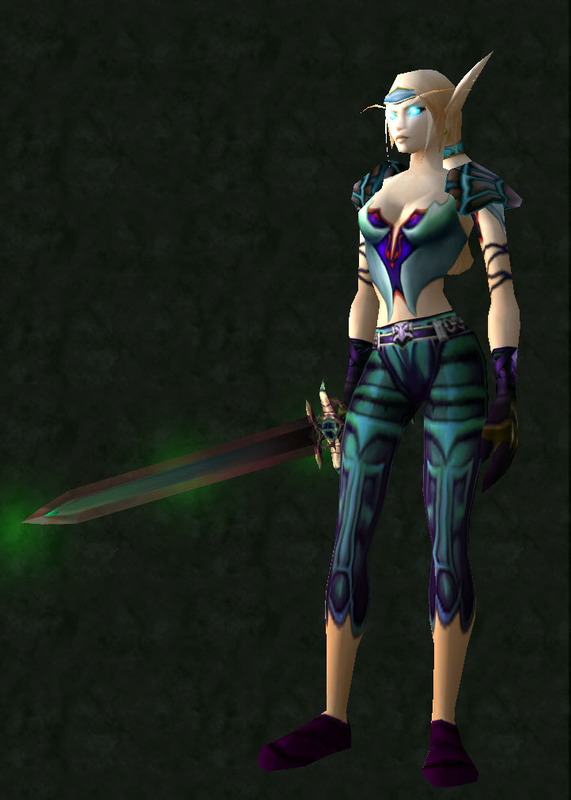 The top is a separate piece to the pants so I can see lots of transmogs for my alliance leatherwearers that use that top. This was a really fun collection to complete, even if frustrating waiting for the right drops. 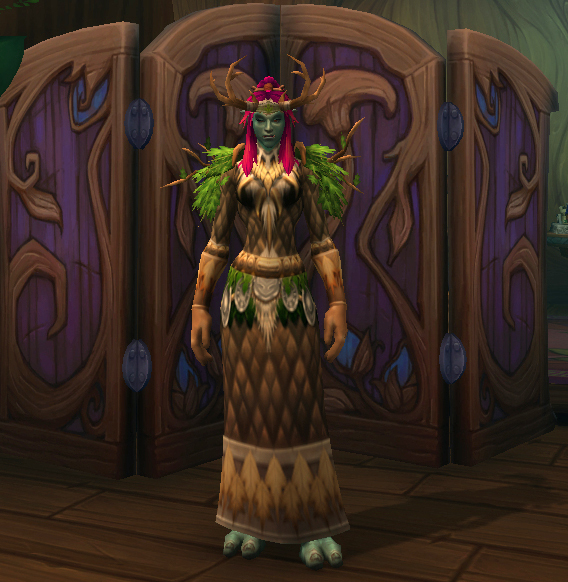 I think now the Druid set is complete I might pick another class and start their collection. It feels like it’s been a relatively quiet week in WoW. I don’t think I’ve got up to much out of the ordinary. Z’s sitting at trait 53 so there was quite a few mythic pluses done over the week to gather up more artifact power. She only has 2 mil to go and then I can stop the serious grind for a bit and just gather AP as it comes my way. 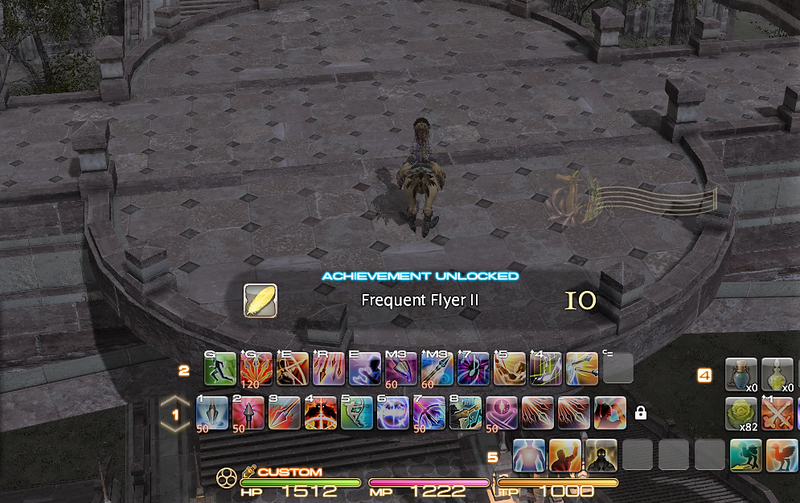 I only did a 15 this week, I didn’t really feel like pushing higher keys and a 15 does give good loot. Maybe next week I’ll try for a higher key. 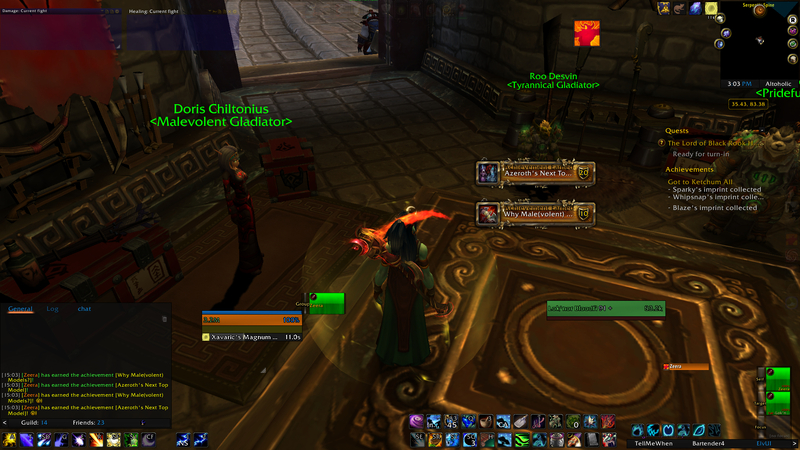 I ran some old raids and picked up a few achs. 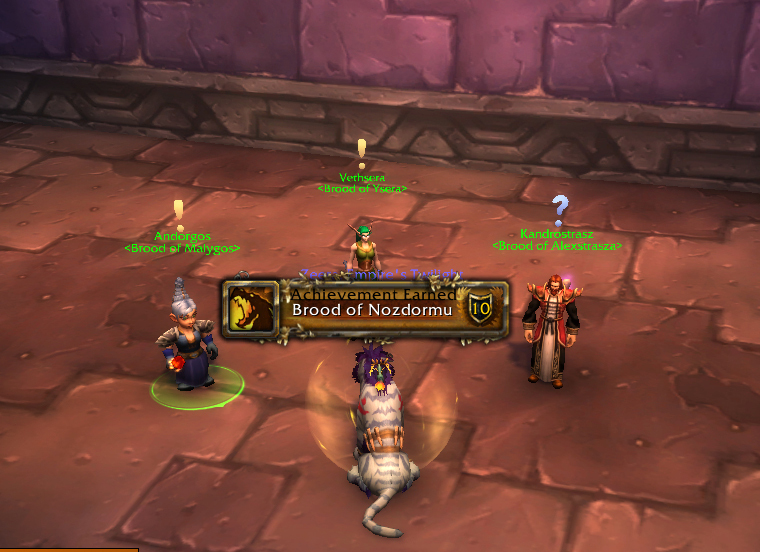 AQ 40 gave me the last bit of rep for Brood of Nozdormu, so now only 9 reps to go! 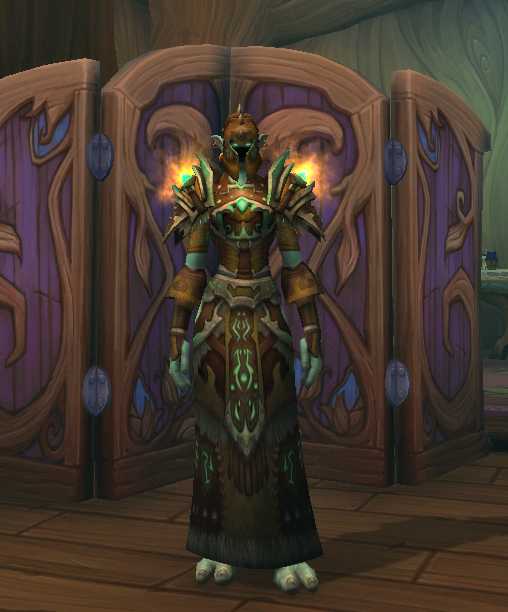 I also got a new transmog out of there and only have Tier 2 to go and my order hall racks will be full. 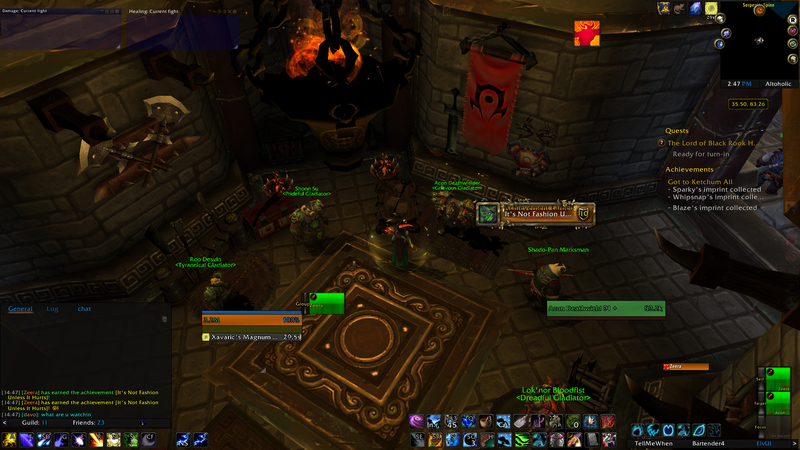 I also ran through some old WoD raids with Twice and Kublas and picked up two new titles and a few extra achs. 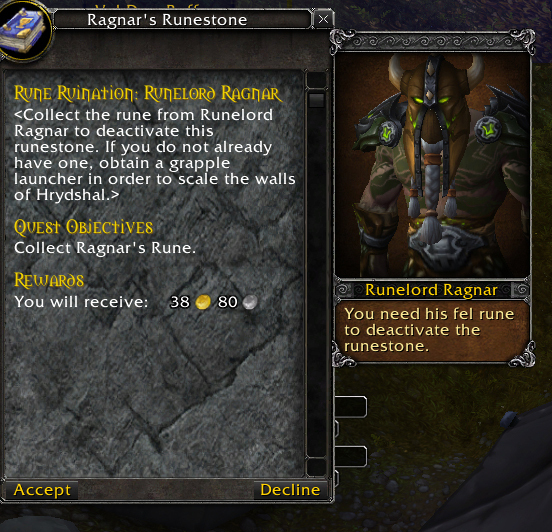 I’ve been working on my Demon Hunter’s campaign and I was super excited to see a Vikings reference in the quests for it. Lucky I’m only doing it now because a few months ago I had no idea of the series and I wouldn’t have got the references at all. Funny enough I was actually watching one of the new episodes while doing the quest! A couple of weeks ago I want into SOO with Kublas and he tamed Thok, so over the weekend we went back so I could also grab him for my own. He’s so adorable as a mini dino. I want to find a blue flashy transmog to match him. 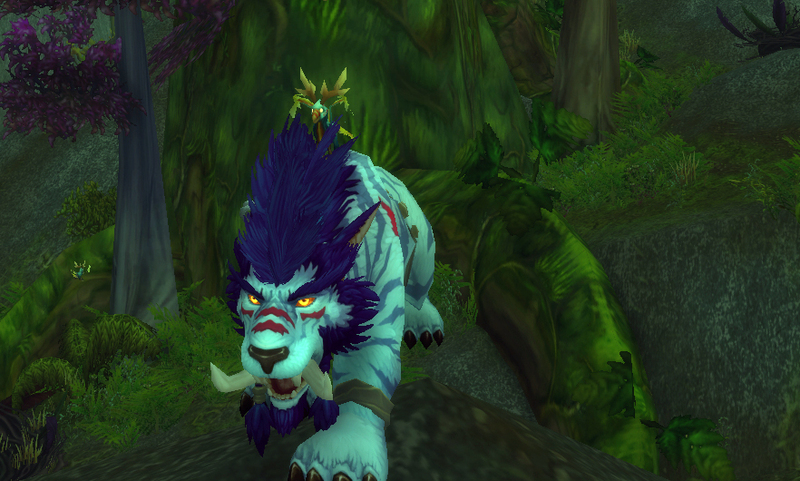 On one of my pugs into Heroic EN this week (I really do like that raid), the hidden appearance for bear dropped! 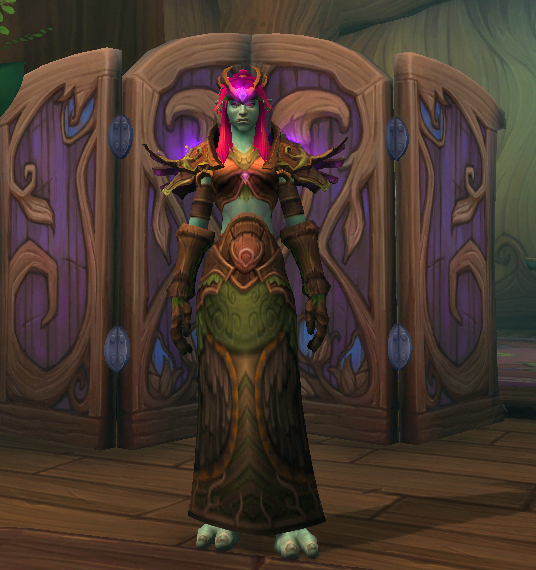 Now I have all the hidden skins for the 4 Druid specs so I’m pretty lucky. 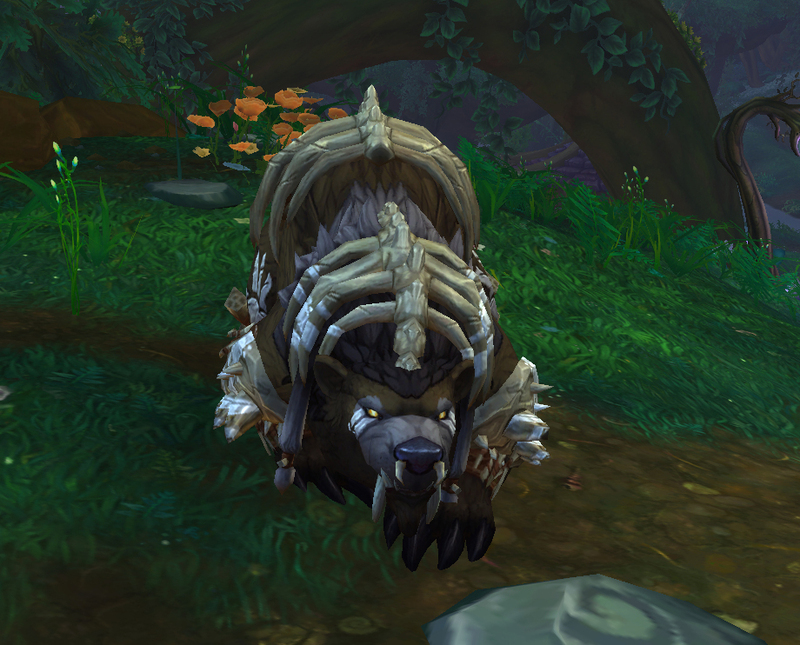 I really like the hidden appearance for bear, in its little cage of bones. 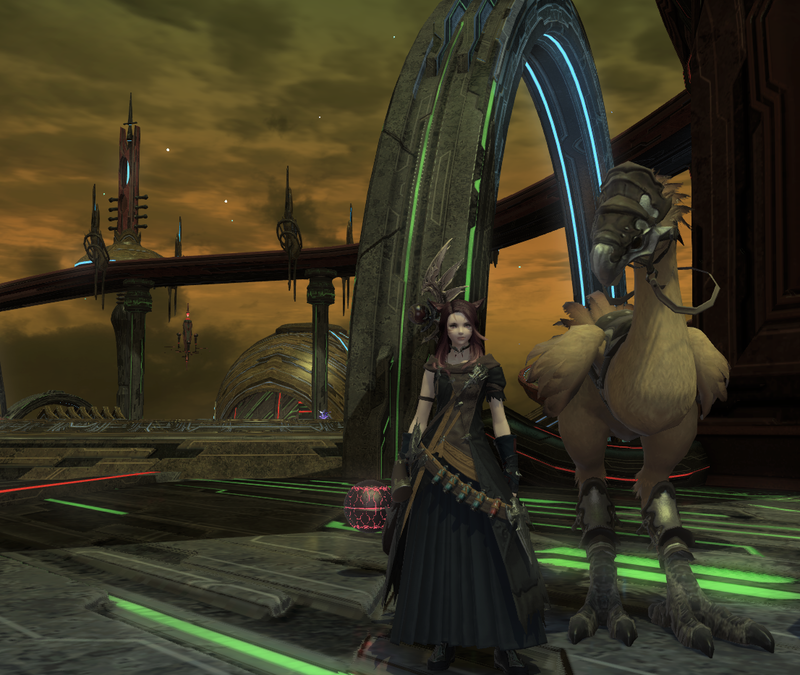 The hatching of the Hippogrpyhs was on so I popped down with Toco as we were both on druids and had the easy port into Feralas! 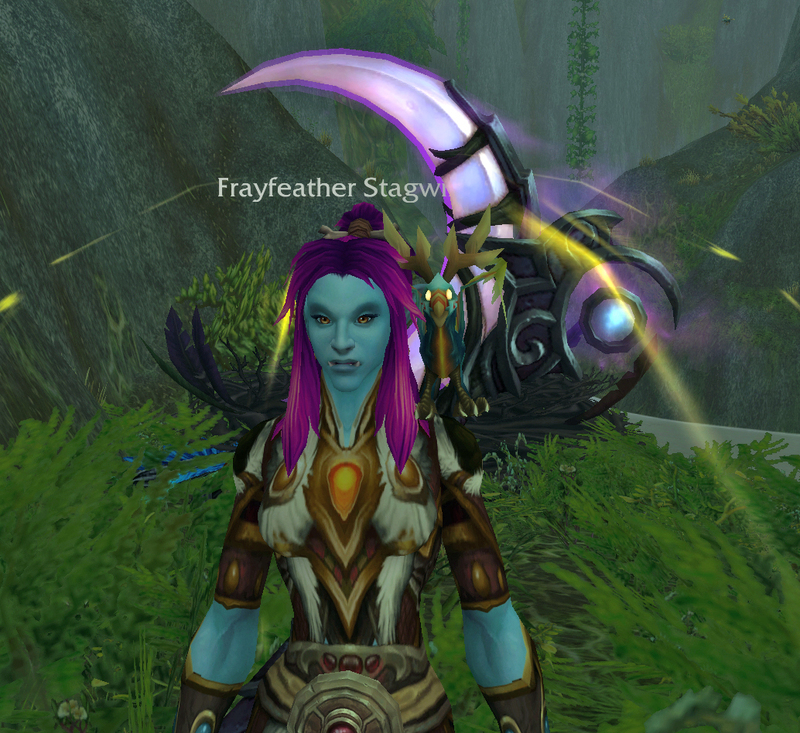 I got my hippogryph baby and picked up the item that made it last the extra days. 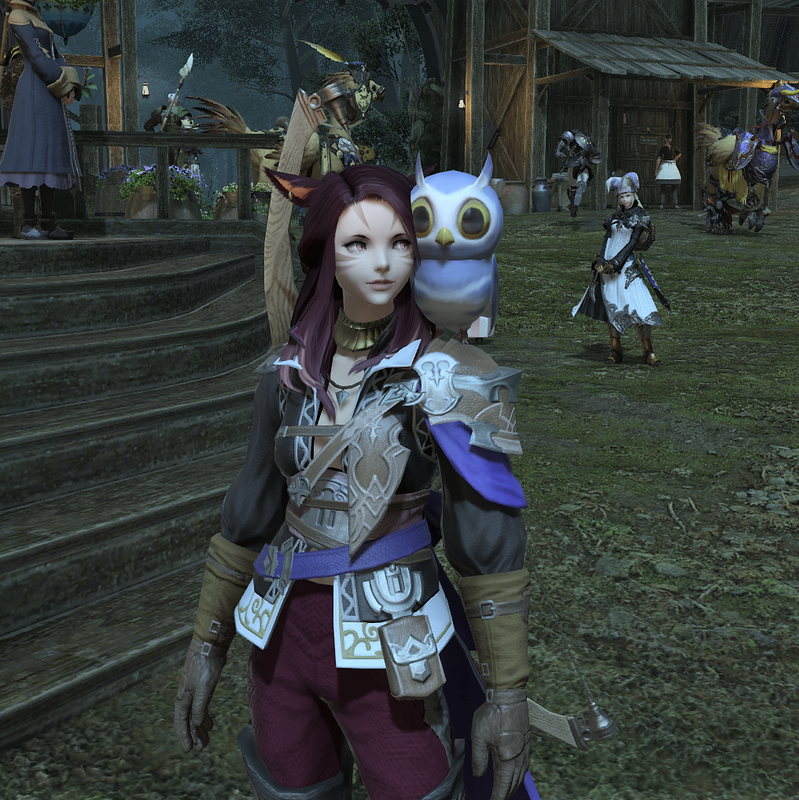 It was really awesome having it travel around with me and so super cute how it sat on my back in cat form. 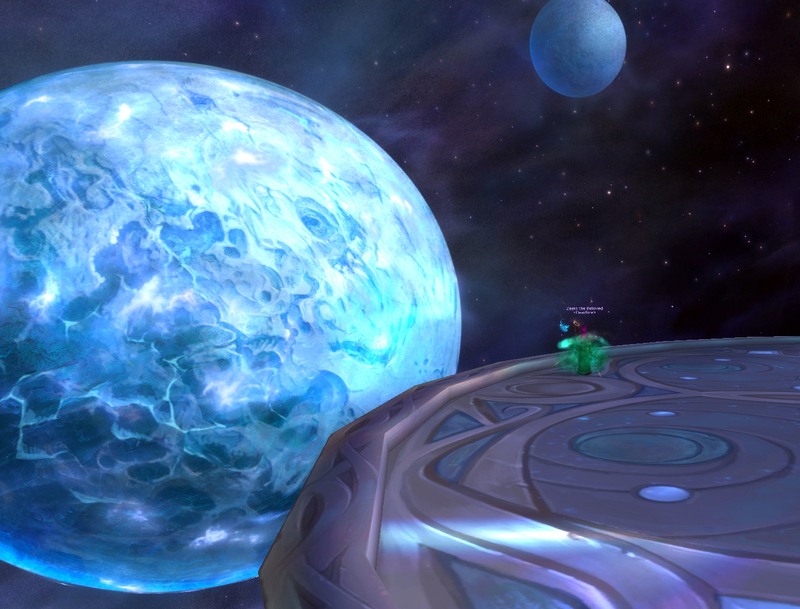 And ever since I’ve started paying attention to the Star Augur scenery I’m still seriously blown away by how gorgeous it is. This week I’ll have to try to get some better screenshots and ones of the void infested planet as well. 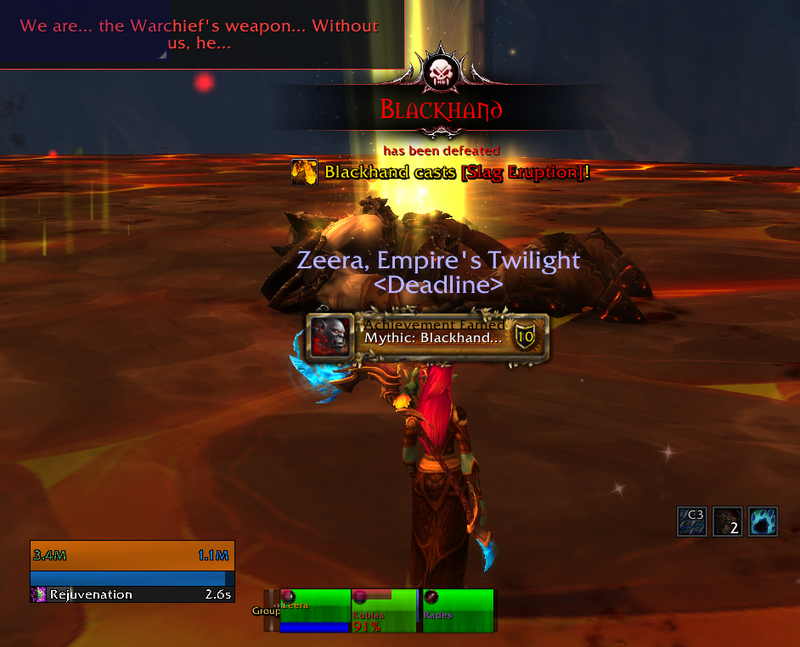 And that was my week in WoW. Let’s see what next week brings. 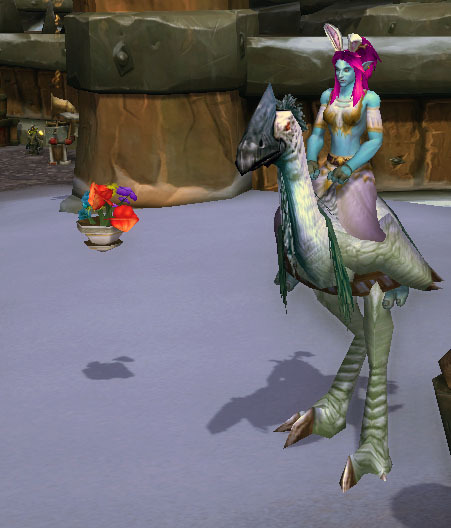 How was your week in WoW? I haven’t had a great deal of time to spend in wow lately, real life and trying to get my head around a research thesis which I just can’t seem to find inspiration for has kept me out of Azeroth more than I’d like. 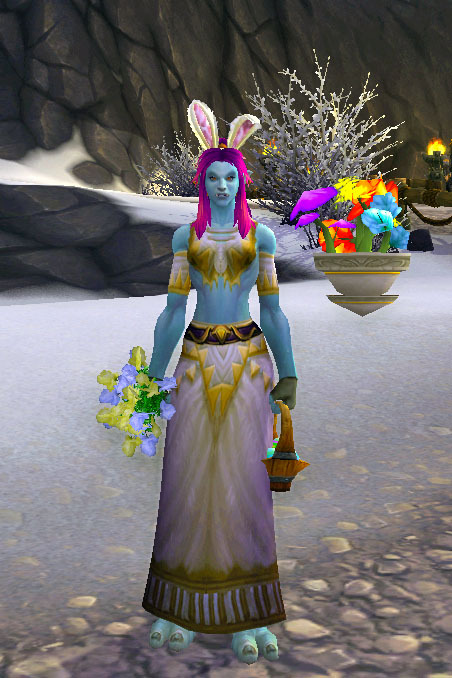 But a friend texted me today to see if I had collected enough eggs to buy the new Noblegarden pet and as I hadn’t logged in since the event started I decided I’d make a little time and log in tonight. 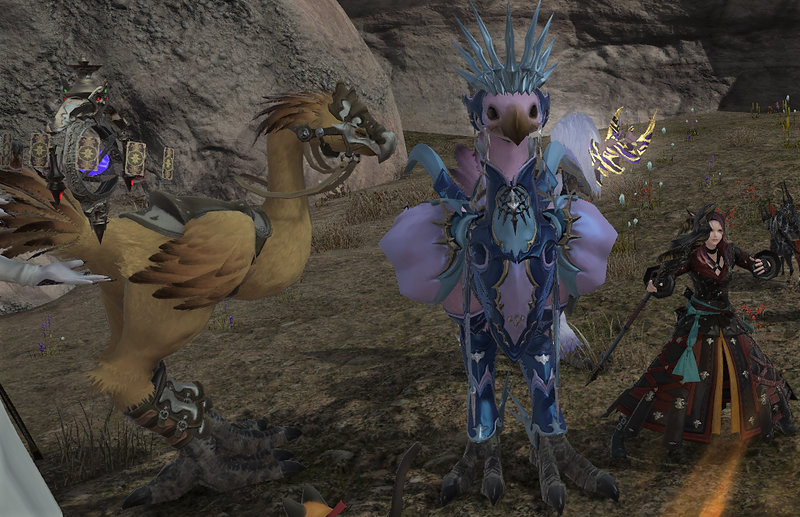 I’ve never hunted for eggs as a hordie before and even though wowhead suggested that Falconwing Square is the best place to collect eggs in, I was able to get to Razor Hill faster so thought I’d try there. 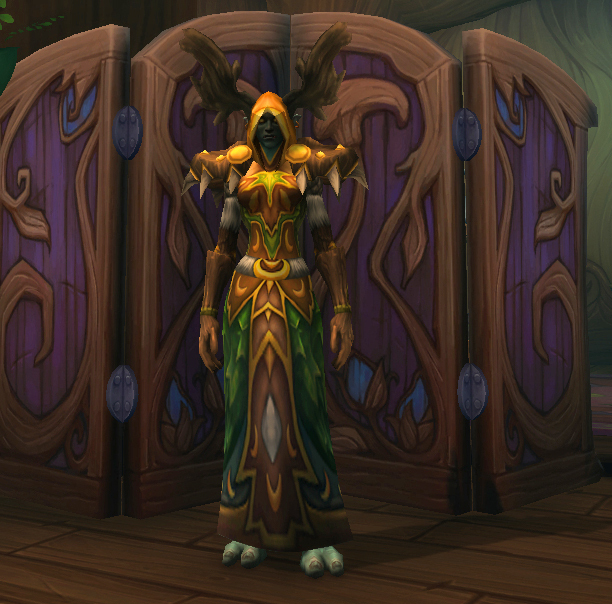 I was pretty lucky in that the place was almost deserted and I could collect eggs in druid flight form (yes I did feel a bit guilty but the convenience outweighed the guilt) so I did a few laps until my free bag spaces were full of eggs and started unwrapping them to get the chocolate currency inside. 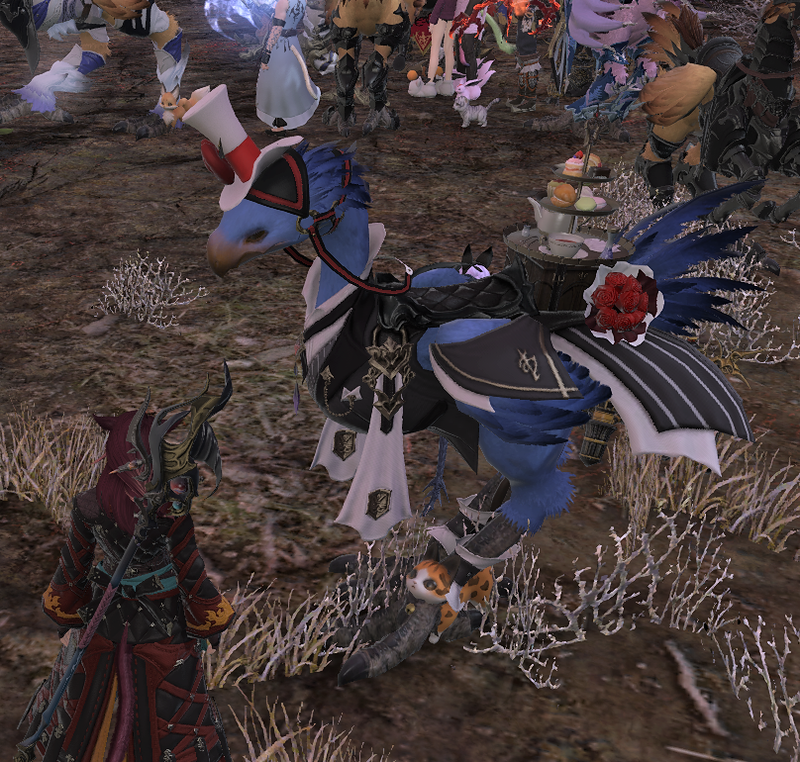 It was going to take me 100 choccys to get the pet and 500 more for the mount. Seeing it was so deserted and the eggs were piling up really fast I thought I’d see how far I could get into the 600 needed before my patience and time I could justify ran out. 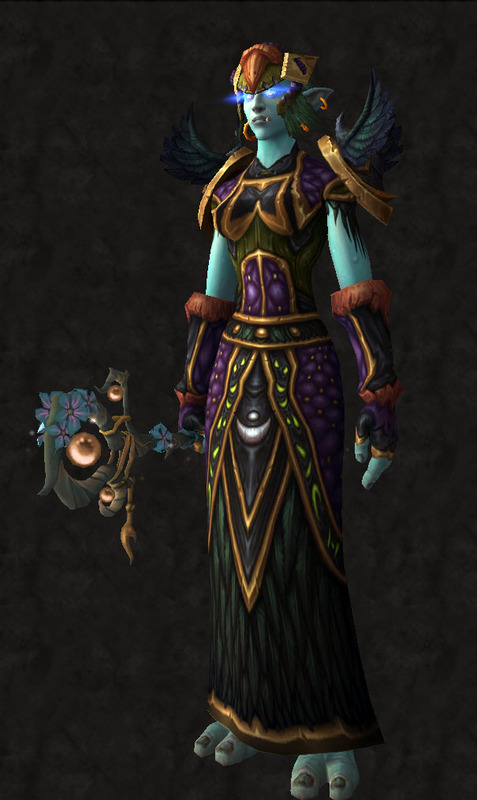 Since upgrading Z’s salvage yard to level 3, I’ve slowly been accumulating pieces of the Springrain Transmog set. 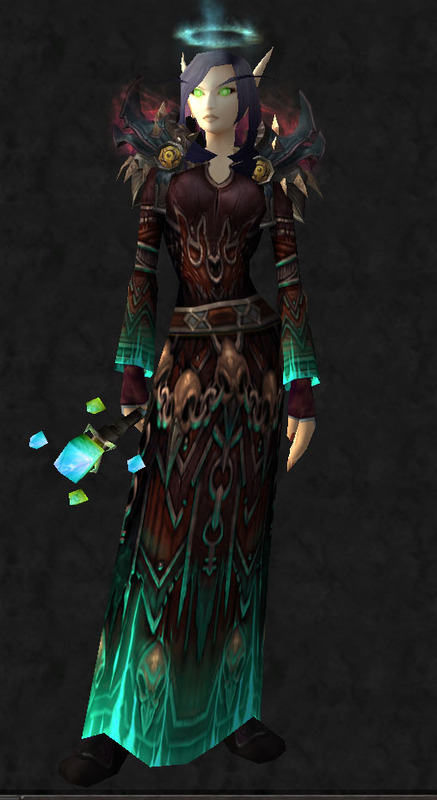 This is a transmog set solely for druids. 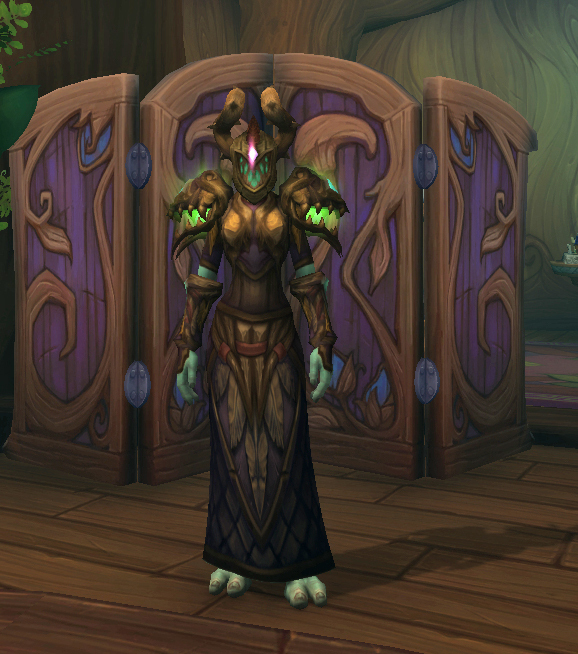 I ‘ve been really interested to see what this set looks like; I didn’t want to spoil the surprise and check it out on wowhead before I collected all the pieces. 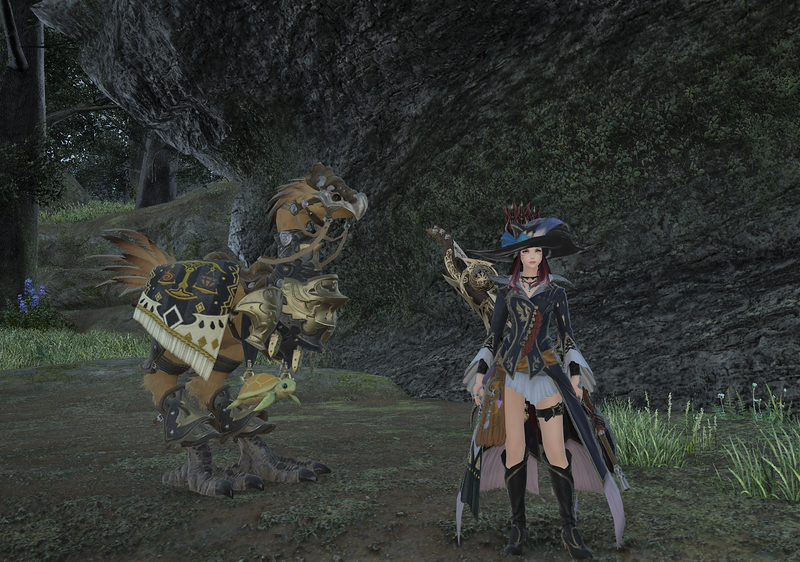 I finally got the last piece tonight, which was the chestpiece and it really pulled the whole set together. 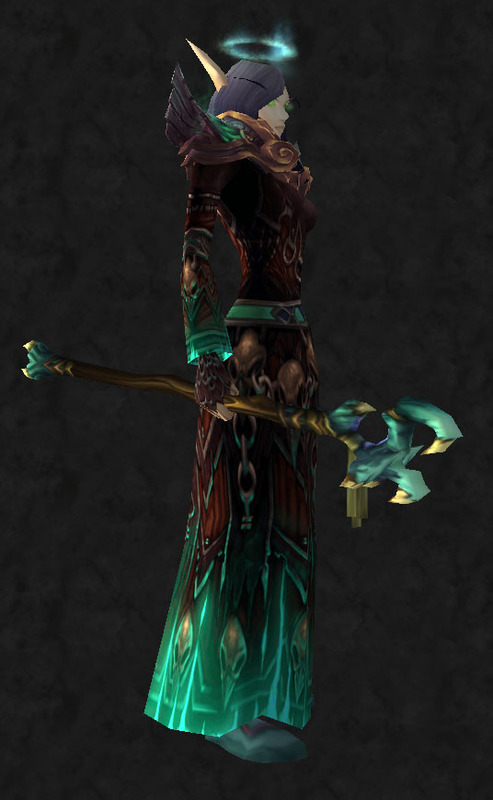 The outfit is quite nice, I’m not really sure if I like the staff with the set, the colours don’t really match that well I think. 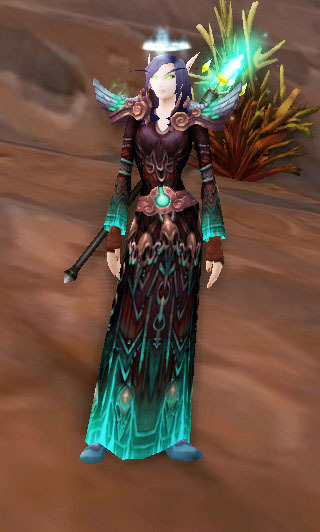 What I really love is the shoulders, the iridescent black/green/purple feathers are just beautiful. 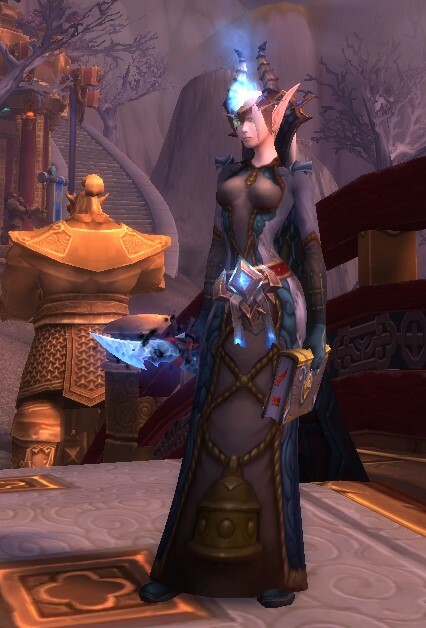 My shaman has a level 2 trading post in her garrison so I might upgrade it to level 3 and start collecting the shaman set to see what I think of it. 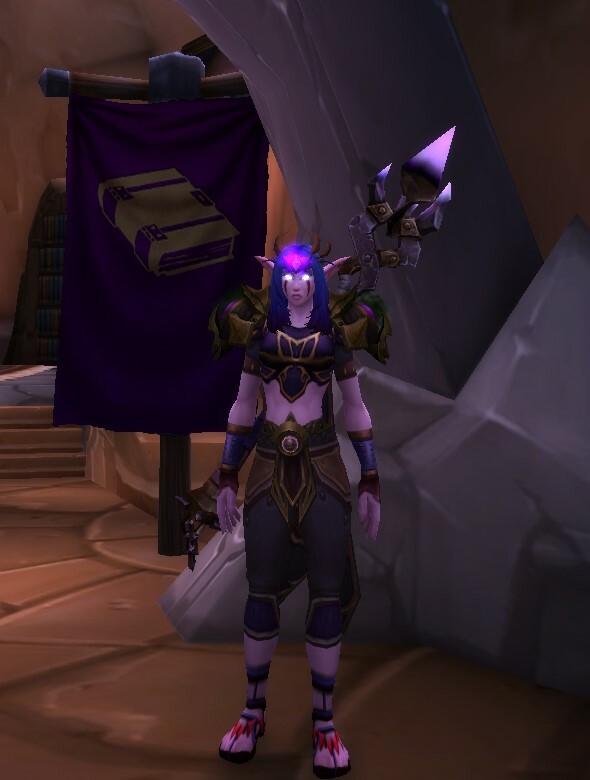 I love Outland gear, some of the prettiest pieces come from there and many of the BOE drops that go for a lot of gold on the AH have equivalent versions from quests. 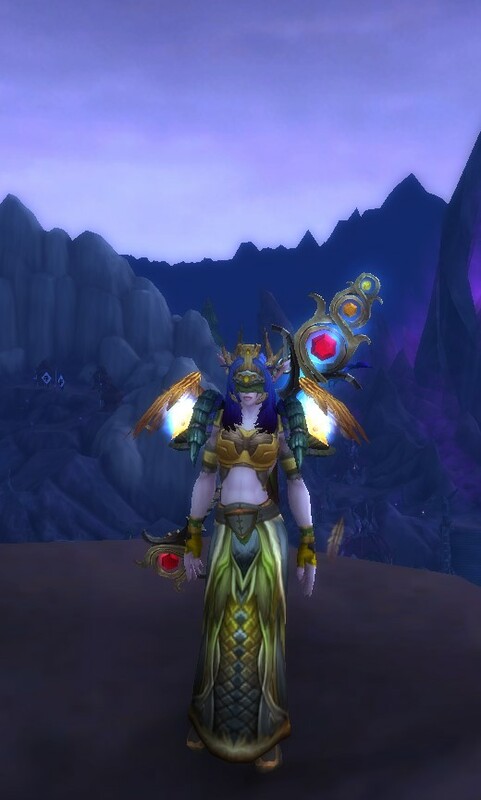 When I saw Dragonray was running a transmog challenge to make an outfit only using Outland items I couldn’t wait to join in. 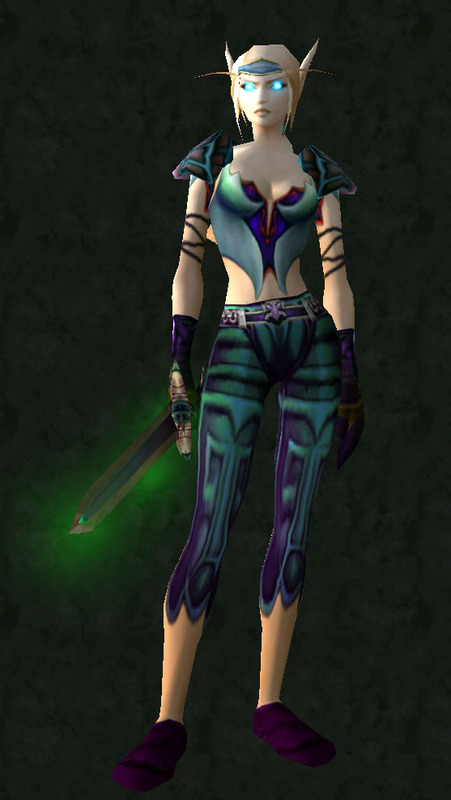 Any gear from Outlands – yes Mages can wear plate in this altered reality and Paladins can wear leather. Mogit/model viewer entries are accepted. Ingame images with gear and Outland backgrounds are definitely welcome. 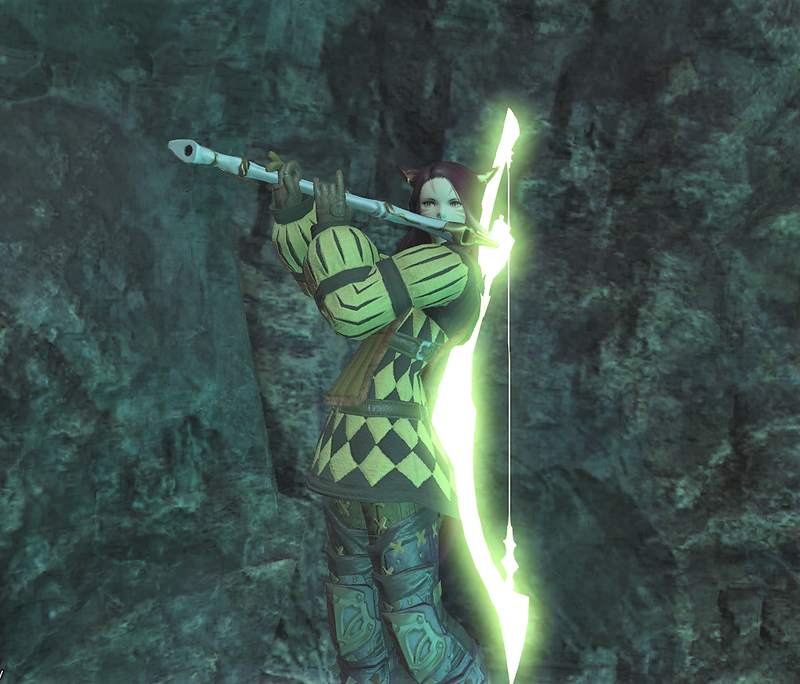 I have been farming all the pieces up in this set since the majority are from questing with a couple of dungeon drops but I just couldn’t get the boots to drop from Murmur in Shadow Lab so unfortunately my entry is a Mogit entry. 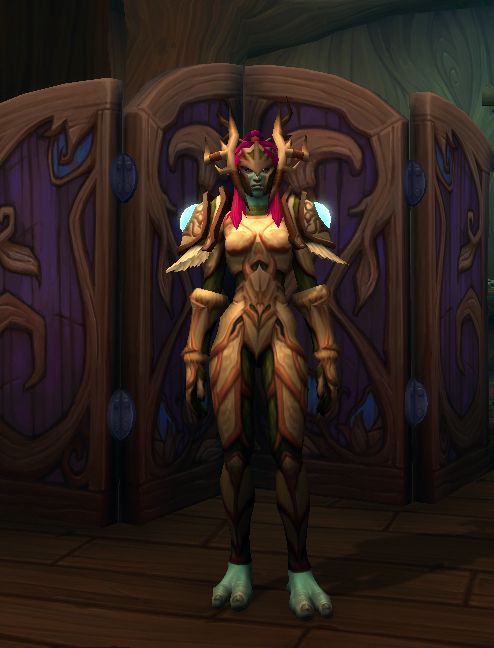 This uses a variety of armor types so can’t be transmogged into for real. 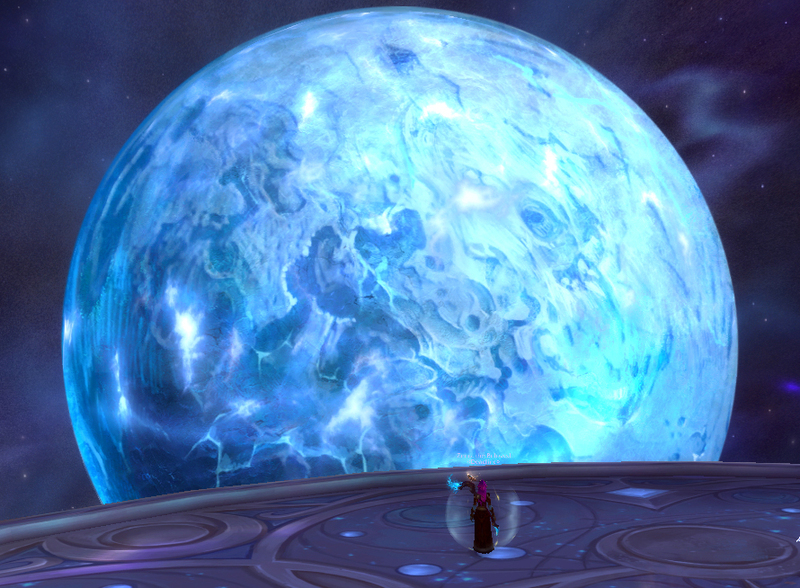 I haven’t been up to anything earthshattering in Azeroth lately. I was the really lucky recipient of a lil’ kt from being one of two winners for June’s ROYGBIV competition from MoMar. Cymre was the other winner but all the outfits were really lovely. 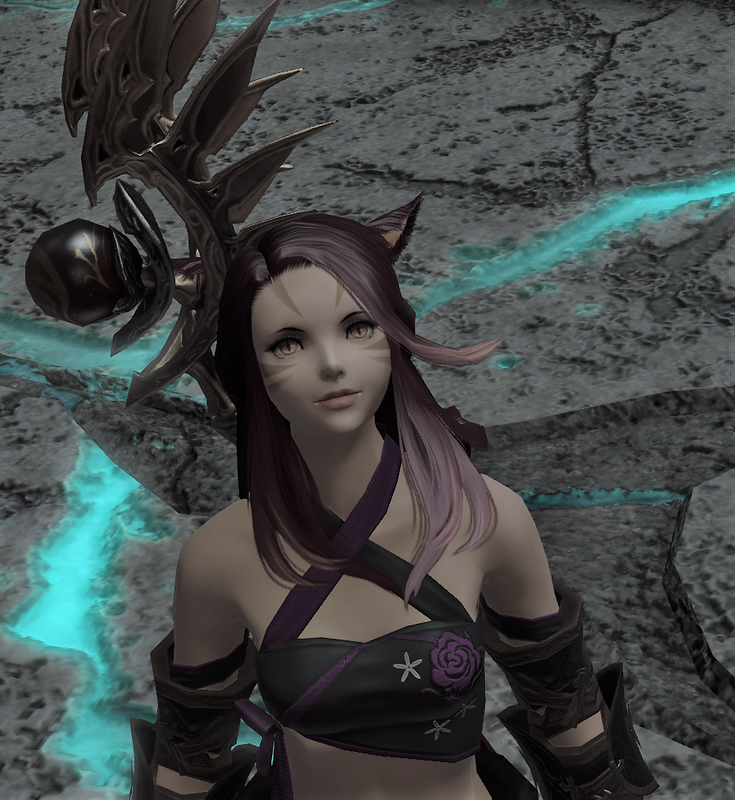 I’m working on a purple outfit to match a lovely purple sword I picked up for July’s entry but I just can’t seem to find the right shoulders or head item to match it. 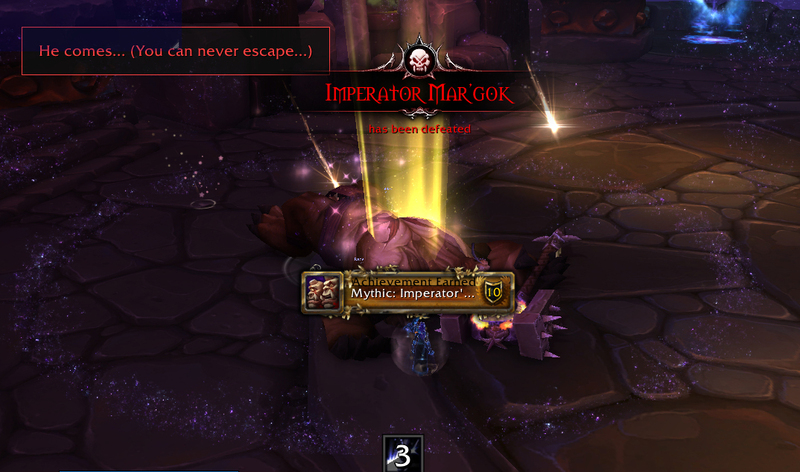 My druid finally got exalted with the emperor so no more having to kill ordos worshippers for a while. She also has 3000 lesser coins so won’t need to worry about doing any coin farming for a while either. I’ve been doing a ton of archeology lately. My mage is my digger and she’s working to get the crawling claw from Tol’vir ach. I’ve turned up tons of really cool fun rare items so far but no claw. Most frustrating. 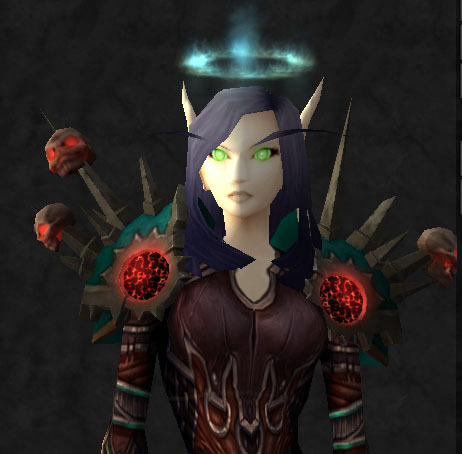 Apart from that I’m tossing up moving some of my main toons over to Saurfang. 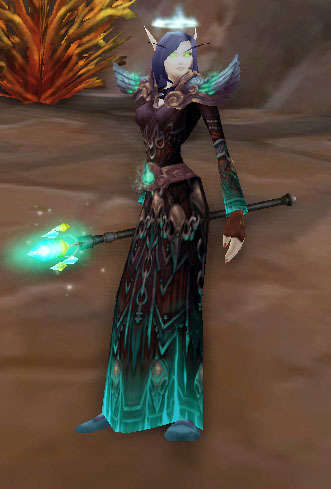 I’ve already decided to move my mage; I’d like to be in Frostwolves a bit more than just when the urge to level Henrii takes my fancy and my mage is the toon I’m spending my most amount of time on lately. 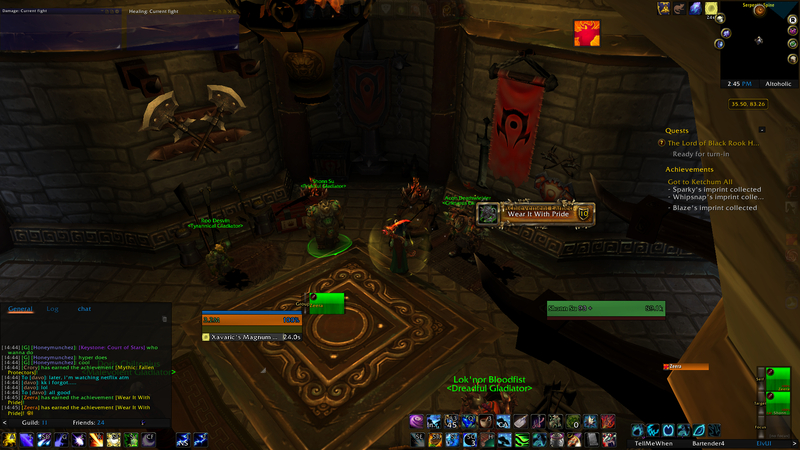 Now I’m not raiding in Well Equipped I’m really over being on a PvP realm and I’d like to be in a friendly guild again. 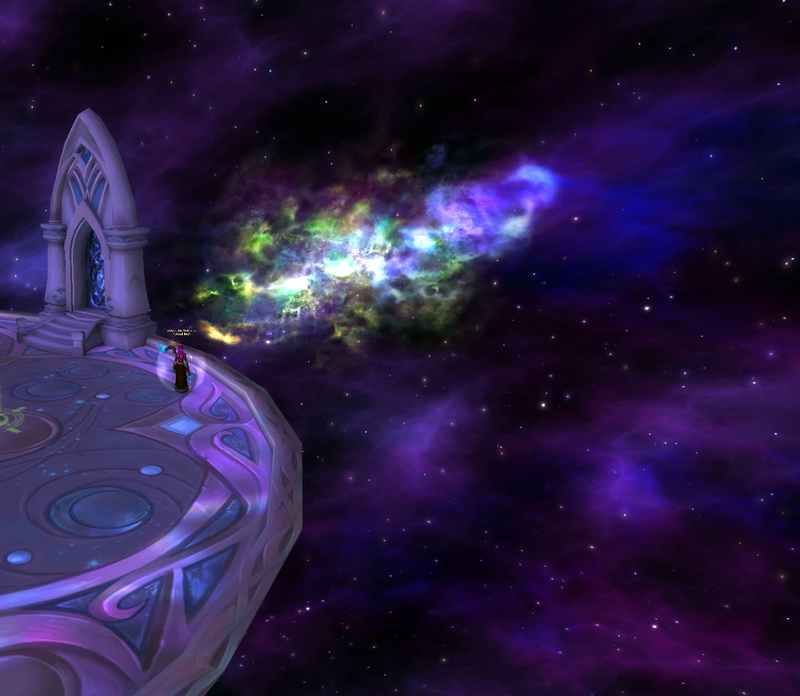 I have moved a few of my toons into Cinders guild on Barth and they are lovely but I’d like to play on a non-pvp realm. 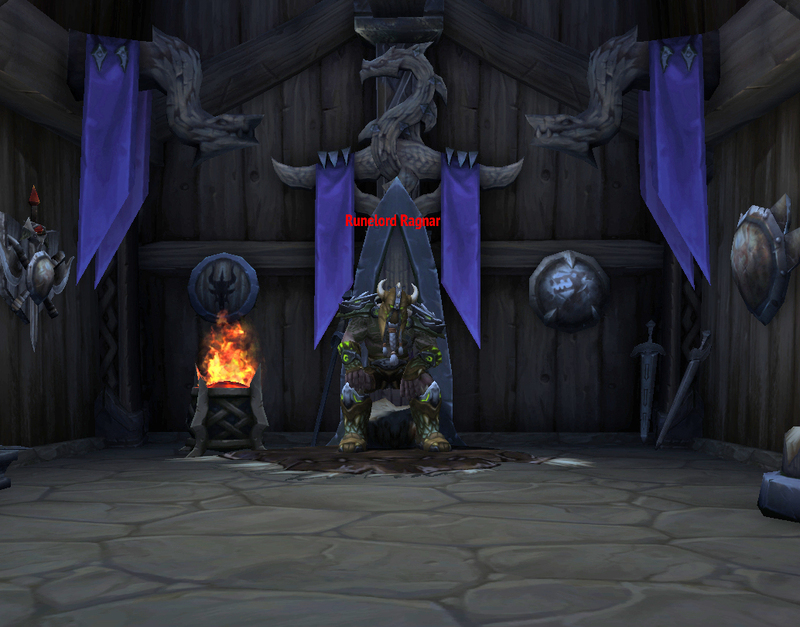 Thinking long-term – I don’t want to be grounded in WoD and on a PvP realm either. So that will happen sooner or later. 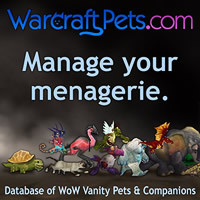 Apart from that it’s just lots and lots of pet battles. I have one more pet to go before I have all the celestial tournament pets so that will be another 2 weeks there. 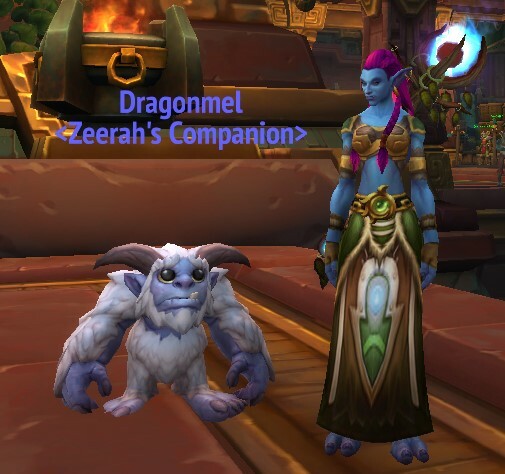 I did expend a rather significant amount of my gold onto an ethereal trader companion pet because there was a rather fierce bidding war going on Barth which drove the prices right down. Though I haven’t really decided if I want to keep it or see if it will be re-sellable and maybe turn a bit of a profit. The decision between possibly obtaining gold (which will no doubt be spent on obtaining more pets) or keeping a really cool pet is a little tricky atm. Well that’s my flying update of how my wow time is spent. What are you guys all up to? 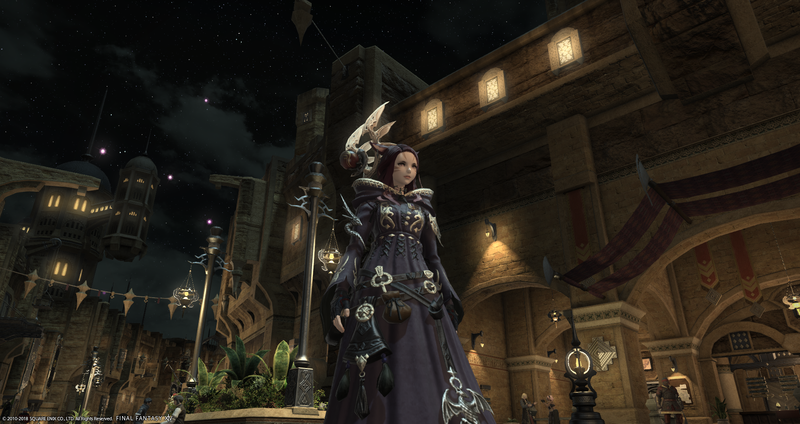 One of my favourite robes in the game is Robes of the Umbral Brute. 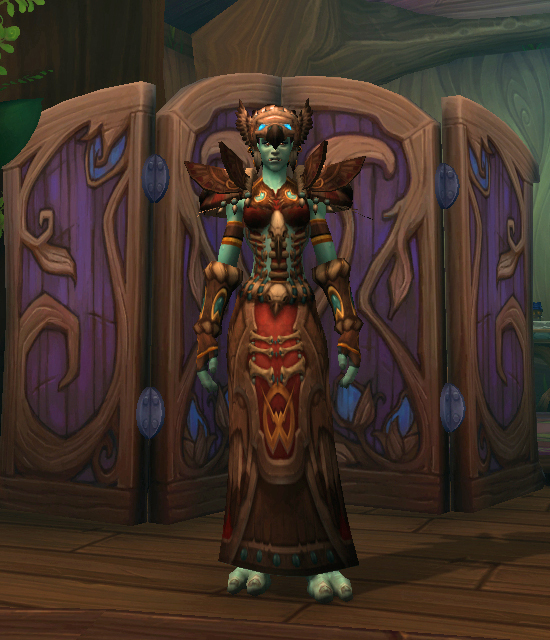 They drop from Kolgarn in Ulduar but most of the times I’ve seen them drop I’ve always been on a non-cloth class. They dropped a few times during my ulduar runs with my little priest but I didn’t want to need on them as I don’t really have plans to play her since I already have a 90 priest and it would have been a waste. 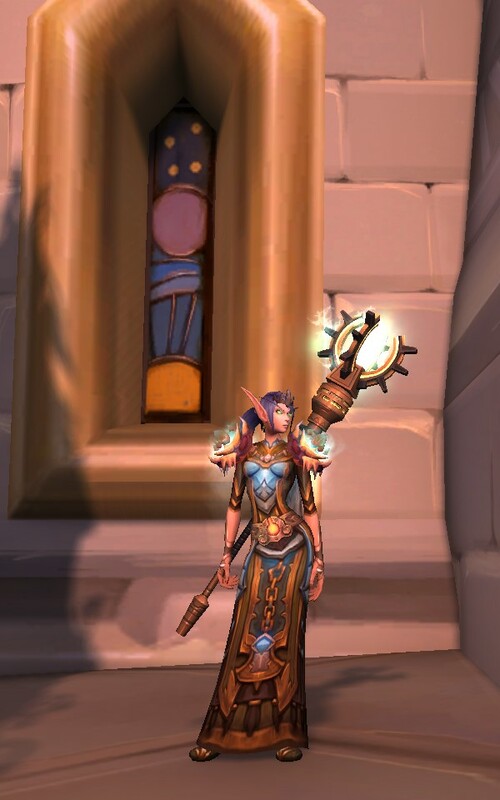 Today, I took my 90 priest to Ulduar and the robes dropped for her, first go. 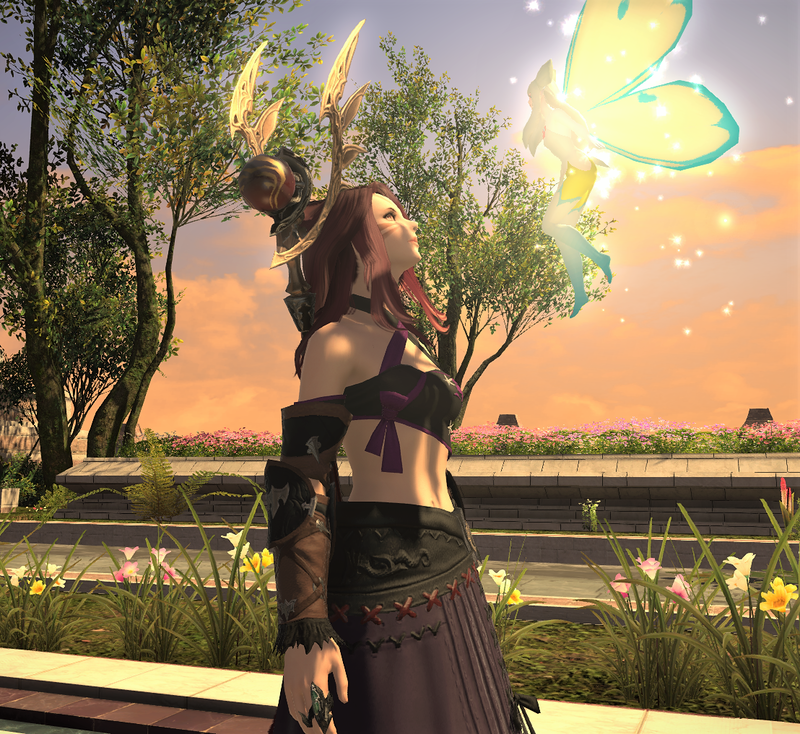 I was very excited and keep trying them on through the rest of the raid and once out, hurried back to the shrine to sit and play with mogit for a bit. 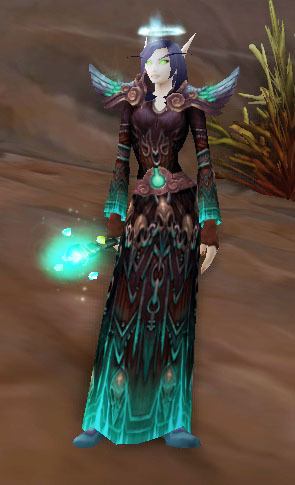 And that when I discovered that while the robe is gorgeous, finding items to match the distinctive aqua is actually very tricky. are too warlocky in my mind. I finally came up with a number of combinations but each had issues; they involved current content or content that couldn’t be solo’d easily etc or was going to take a lot of time to get the pattern or mats to craft and I wanted to wear it now. A few combinations I tried. 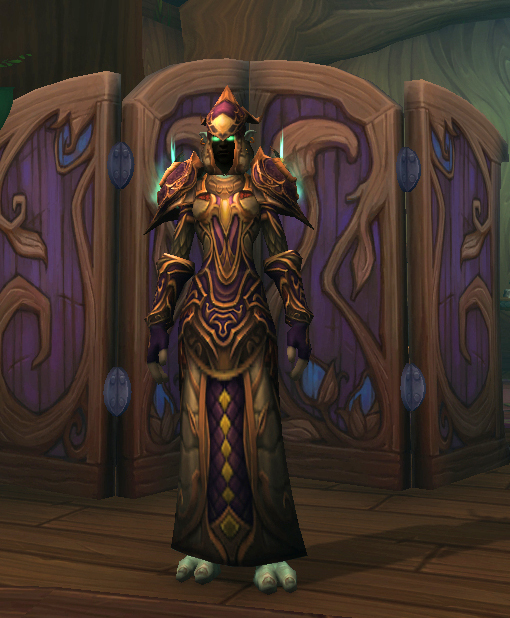 I might go track down the staff on the left and the middle shoulders and belt; I do like those pieces a lot. 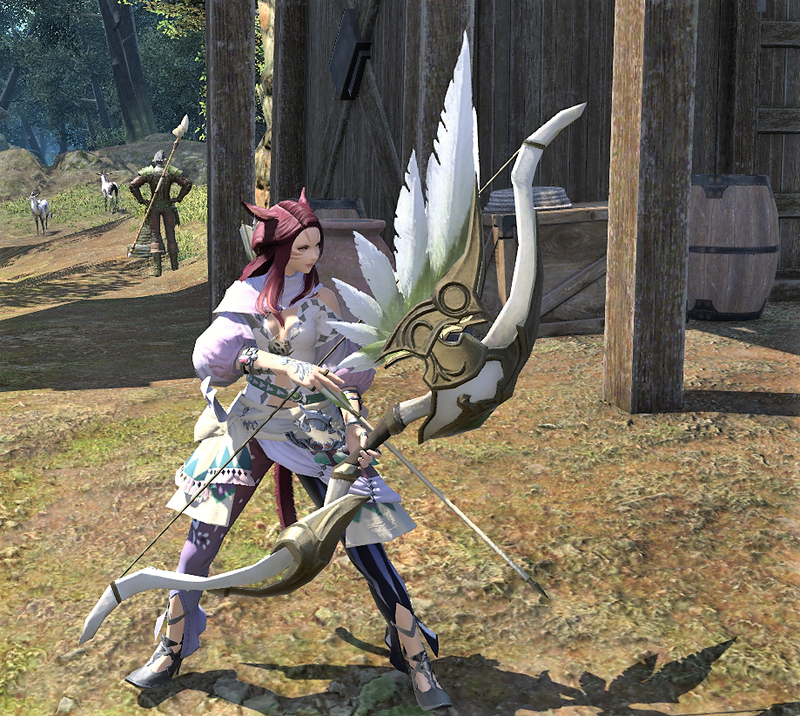 I finally came up with a combination that uses mostly gear I already have and 2 seemingly quickly achievable pieces. Shoes that drop from Aucheni crypts on normals so can be farmed easily and a staff that has 4 different versions of the same colour so finding one version of it shouldn’t be too hard. The shoes dropped on my 4th run through the dungeon and I went onto to looking for the staff. And that’s where I ran into trouble. 1. Totemic Staff. 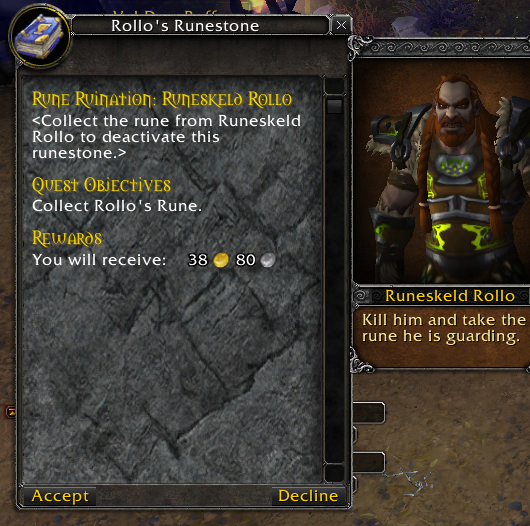 Quest reward in hellfire. I havent quested much in hellfire on the priest so that should be easy to do. 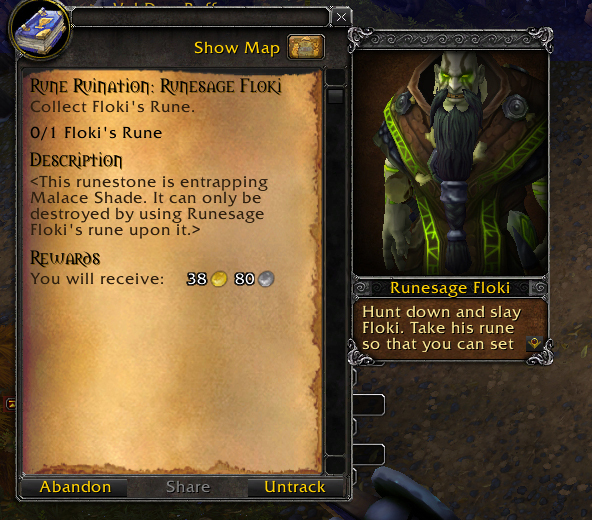 But when I got there I found the quest was removed in Cataclysm along with the associated staff reward. Drat. 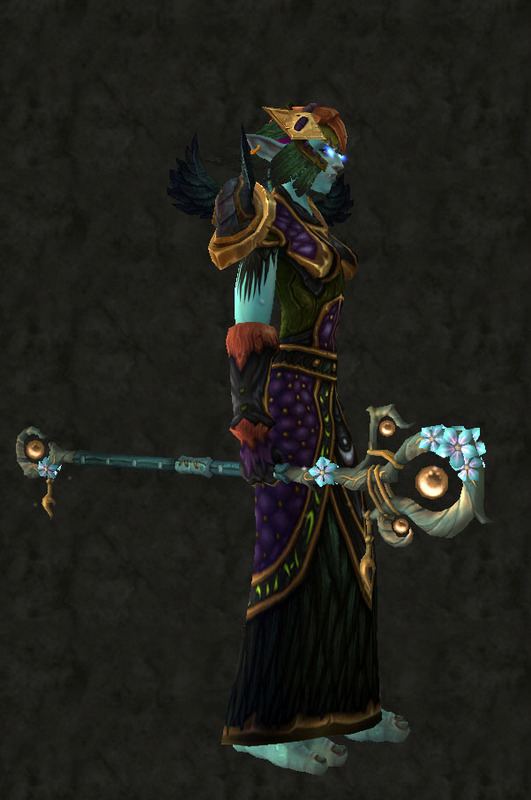 Onto staff B.
I decided that no matter what I’ll go ahead and make the transmog with the pieces I had and use whatever staff is in my bank that suits it the most and that’s when I discovered… I had an unequipped Magus Staff tucked away in my void storage!! 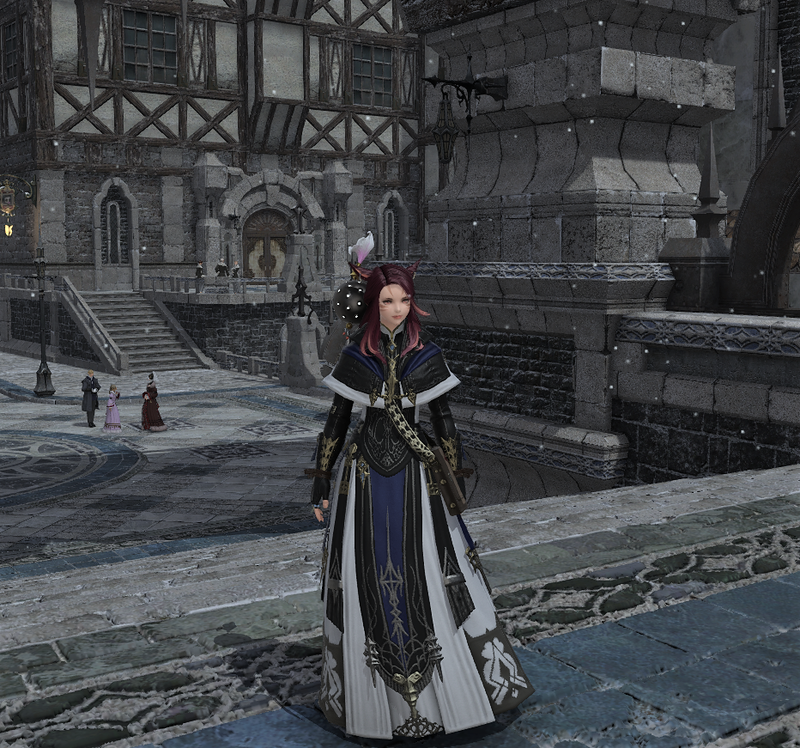 Maybe these robes aren’t so unmatching after all.